Yesterday I attended a women's prayer and bible study group, I have been going to this group for 13 years, the verses we were looking at along with prayer led me in my mind back to the south west where my walk not only started but my foundation thinking formed. I did not have a church to help me, I had to rely on the Word. I lived in a tough environment and one thing I learned fast was that I could depend on the Lord to lead me and keep me safe. He never failed me. He led me as a tender shepherd, brought me peace and comfort. I learned to rely on that voice. 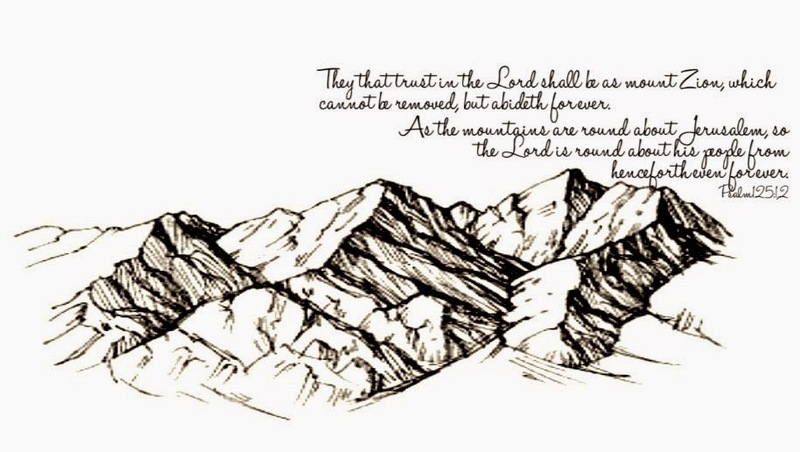 'They that trust in the LORD shall be as mount Zion, which cannot be removed, but abideth for ever. I kept that verse on my dresser for over 20 years. When the father of my children left me and I remained single for almost a decade raising my kids, it brought me great comfort to know that that while man may not be faithful God always is. It reminded me of how temporary the things of this life are and how enduring the Love of God is. It reminded me that by trusting God I could never be removed from His love and that He would never leave or forsake me, that love was both around and in me. I think of those verses and I am struck with the agelessness of the Creator, and the whisper of time my own mortality occupies. I was not there when those mountains were set round about Jerusalem, and after a few moments when I am gone, they will still be there, holding and protecting future generations. I invite you to think about this verse in your life. Are you as Mount Zion, safe in the center of His care, His will? If you aren't pick up your bible and turn to PS 125 and ask the Lord to become that real to you and find your self embraced in His love. His love that is ageless and stronger than mountains. I made this freebie for you today, to use in your art work or maybe to frame and put on your dresser. I pray God Bless you richly meeting your needs above and beyond your hopes! I love the new headline photo Ginny - it's a little fresh breath of spring! !